Another favorite at Chez Solange Restaurant in London in the seventies where I started as a waitress with a French accent. 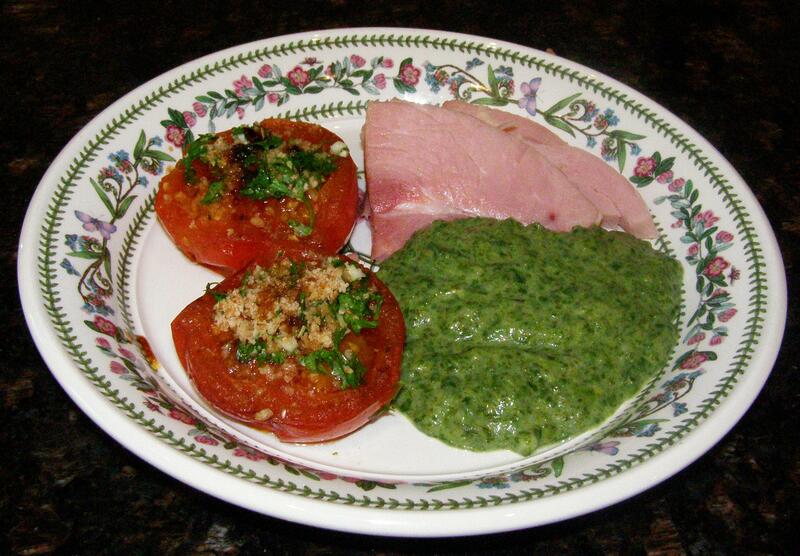 It is often served with a roasted ham with tomates provençales on the side for a colorful plate. Interesting fact is that one does not just throw cream on top of the spinach, or maybe that is a “nouvelle cuisine” short cut. In my opinion, too fat, too thin, no taste. Here is my way! You need one bunch of spinach per person, well washed under cold running water and the base of the stems removed. Cook them in a large pot in salted water about 10 minutes, hydroponically grown spinach cooks faster. Drain very well, squishing all the water out. Chop in the food processor either medium fine or really fine. Rub the bottom of a cast-iron or non-stick pot with 2 clove garlic halved. Turn heat on low, add two pieces of butter the size of a walnut and one tbsp flour. Stir with a whisk and add slowly one and a half cup cold whole milk and keep whisking to smooth. Let thicken quite a bit. Turn the heat off, add 1/4 cup cream, salt and a pinch of nutmeg, then the spinach. This much sauce is good for six. If you are not sure, add the sauce to the spinach instead and stop before it gets too liquid. Do not reheat on the stove, but in the oven. The cream spinach should not turn brown. Tip: the spinach can be on its own or combined with either beet leaves, arragula, or sorrel. 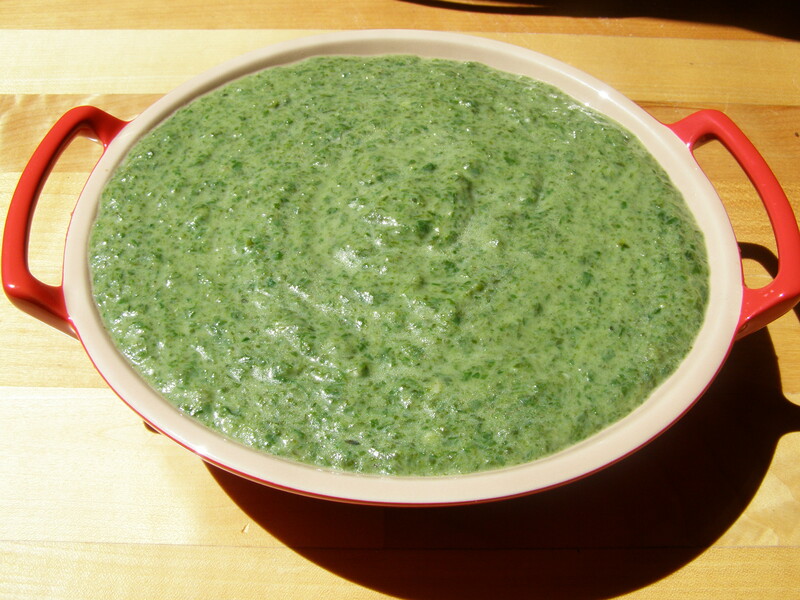 This entry was posted in Vegetables and tagged cooking, cream spinach. Epinards a la creme, food, recipe, recipes. Bookmark the permalink. I will make this for my baby soon. It sounds like something he would eat. We love cooking spinach, it’s so healthy.